Steinbrecher, T. & Hart, J. (2012). Examining Teachers’ Personal and Professional Use of Facebook: Recommendations for teacher education programming. 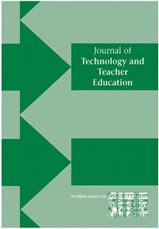 Journal of Technology and Teacher Education, 20 (1), 71-88. Waynesville, NC USA: Society for Information Technology & Teacher Education. Retrieved April 25, 2019 from https://www.learntechlib.org/primary/p/35265/.